This is my favorite picture of my mom. 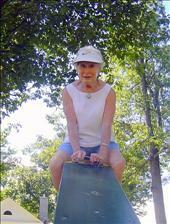 There she was in the park with all the grandchildren and they wnated her to go on the see saw. So she did. That’s my mom! She is always doing crazy things. One time she showed up at our house dressed as the Beast from Beauty and the Beast. She had purchased the costume a long time ago and kept in up in her cedar closet. It is a 3 hour drive to our house so when they got close she had my dad stop up the street and she changed into her custom and then walked down the driveway and knocked on the door. The kids loved it. I wished I had a photo of that. It was wonderful!